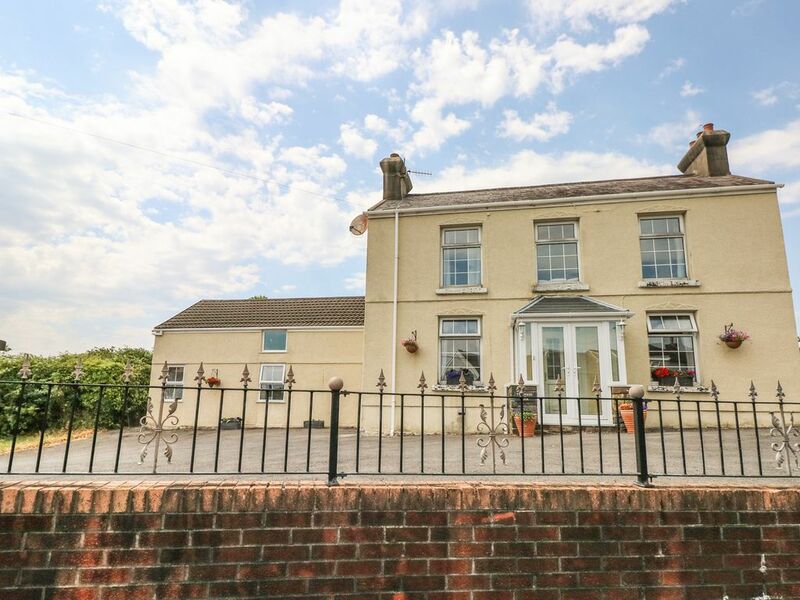 This detached farmhouse sits on the outskirts of Llanelli and is able to sleep eight people across four bedrooms. 11 Heol Hendre is a farmhouse situated on the edge of Llanelli town in Carmarthenshire. It plays host to four bedrooms which comprise a king-size zip/link with a Jack-and-Jill en-suite, a double with an en-suite Jack-and-Jill with a bunk room, there is also a further bunk bedroom, as well as a shower room, the property can sleep eight people. The interior of the property also comes with a kitchen, a living/dining room and two snug rooms. Externally, you will find ample off-road parking as well as an extensive garden with a lawn and a patio with furniture. 11 Heol Hendre is a welcoming holiday home, ideal for exploring this fine region. Amenities: Gas central heating. Electric oven, gas hob, microwave, fridge, washing machine, tumble dryer, dishwasher, TV, DVD, WiFi, selection of books, games and DVDs.. Fuel and power inc. in rent. Bed linen and towels inc. in rent. Ample off-road parking. Patio and lawn with furniture and BBQ. Sorry, no pets and no smoking. Shop and pub 8 minute walk. Town: Llanelli is a former mining town now offering shopping centres, a theatre and the Millennium Coastal Cycle Path. Sports fans can watch rugby, play golf, watch horse racing at Ffos Las, or motorsport at the Pembrey Circuit. The nearby coastline offers many beaches and walks to enjoy. Gas central heating. Electric oven, gas hob, microwave, fridge, washing machine, tumble dryer, dishwasher, TV, DVD, WiFi, selection of books, games and DVDs.. Fuel and power inc. in rent. Bed linen and towels inc. in rent. Ample off-road parking. Patio and lawn with furniture and BBQ. Sorry, no pets and no smoking. Shop and pub 8 minute walk.